Shorewood Villas condo, beach resort home in South Carolina. Direct oceanfront two bedroom two bathroom overlooking the ocean. See Tybee Island from the deck. Watch the dolphins, shrimp boats, and transatlantic ships go to port in Savannah from the living/dining area and master bedroom. Living area which overlooks the ocean has a new queen Sherrill sleeper sofa and loveseat, 48" Samsung television, DVD, and wireless e*print HP printer. Linens for the sleeper are included. Dining area has standard height Bernhardt table and six chairs. Bedrooms are separated to form two suites. The master bedroom overlooks the ocean with a slider out to the oceanfront deck. It has a king bed, 32" Samsung television, full length mirror, entertainment chest with drawers and DVD players, two nightstands with drawers, and two lamps. Also, has an alarm clock with two built-in outlets and a USB port. Large closet with extra king pillows, blankets, shirt hangers, and skirt/pants hangers. All linens are included. Master bedroom has an adjoining full bathroom which has a walk-in travertine shower, cherry cabinets, and Volga Blue granite countertops. Bathroom has liquid hand soap, toothbrush holder, hand mirror, and tissue holder. Additional vanity sink in master bathroom. The guest bedroom has a queen bed, Stanley furniture, one nightstand, one lamp, entertainment center with 26" Samsung television and DVD. Alarm clock has two outlets and USB port. Twin roll away bed is stored in the large closet with blankets, extra pillows and shirt and skirt/pant hangers. All linens are included. Guest bathroom has cherry cabinets and Volga Blue granite. Liquid hand soap, hand mirror, toothbrush holder, and tissue holder. Kitchen has cherry cabinets, River Bordeaux granite counter tops, and LG stainless steel appliances. Refrigerator has French doors with ice and water in the door. There is an under counter ten inch television/DVD/radio combination. Wet bar with Uline wine/beverage refrigerator and Native Trails copper sink. Cabinet with bar tools. 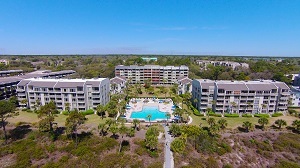 Shorewood Villas Condo Rental in Hilton Head Island SC.